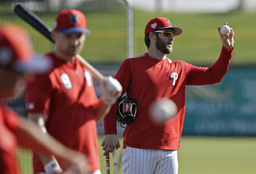 CLEARWATER, Fla. (AP) Bryce Harper played the outfield for the first time since signing a record $330 million, 13-year contract with the Philadelphia Phillies. Harper started in right field Monday against Tampa Bay. He took a 96 mph fastball for strike three in the first inning from AL Cy Young Award winner Blake Snell. "He's good," Harper said. "I was just happy to go out there and face a guy like him, see some velo, see some offspeed, as well, and just see one of the best in baseball. It's always fun to be able to do that whether it's the third game in spring or the middle of the season. It's good to see." Harper then walked in the fourth after Andrew McCutchen and Jean Segura hit consecutive homers off Jalen Beeks. Harper caught two fly balls. He cleanly played a double high off the wall and then made a strong to third base during four innings of defense. "It was nice to see him out there," Phillies manager Gabe Kapler said. "Just kind of take this step by step." Harper was a designated hitter Saturday in his spring training debut and walked twice against Toronto. He did not play Sunday. Both the Blue Jays and Rays used a four-man outfield against Harper. "I don't think they paid Bryce Harper to bunt," Snell said. "So, he's going to hit and hits the ball far. That's where he's going to hit it, so might as well put an extra guy out there and make him think about why they're doing this and maybe that messes with him a little more." Harper will be off Tuesday and is slated to play right field again Wednesday night against the New York Yankees. "I think one of the reasons he signed a $330 million deal is because you raise the bar for yourself constantly," Kapler said. "I think he's done that throughout his career. He's holding himself to a high standard. He knows the expectations are high and he's prepared to meet that mark."